Getting married outside? Considering an outdoor wedding? Why wouldn’t you? It’s beautiful, natural and can add extra romance to the ambiance on the most romantic day of your life. Designing an outdoor wedding may seem easy, because you already have the beauty of nature there—an automatic design. But that is not always the case. Instead of thinking of the setting as automatic décor, consider it the framework for something that can be a little more controlled. Thinking of it this way, and following a few easy, but necessary tips will help you avoid added stress on your wedding day so that you enjoy the day and all the beautiful memories you’ll create on your special day. 1.You chose your venue for a reason. 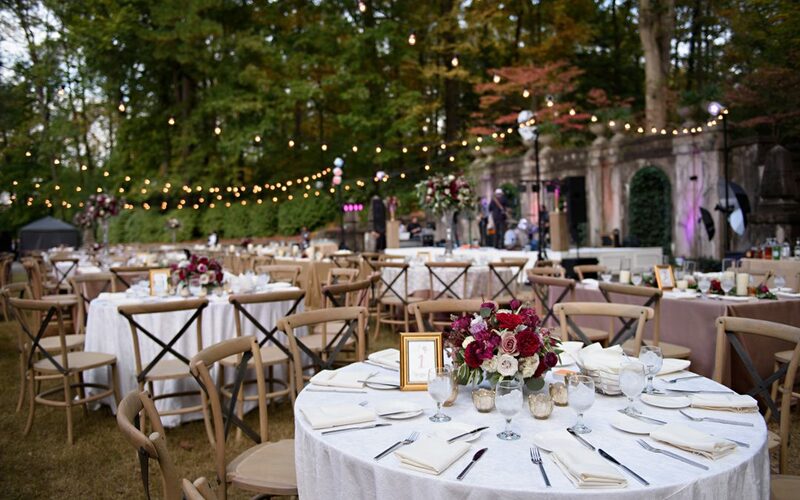 With all the choices of venues in and around Atlanta, you chose your specific outdoor venue for a reason. You loved the way it already looked when you saw it. So why change it too much? Why not complement it instead, enhance what is already there. If you’re in a beautiful garden that has an iron gazebo, try enhancing it with Italian Garden styled or vintage style floral and décor with lots of garden flowers and foliage. If you’re getting married in the mountains, give it a rustic look with lots of curly willow or flowering branches. 2.Choose colors that complement. You have natures colors around you, so instead of choosing wedding colors that can take away from that, like an all red or mixed bright colors, it may be more complementary to use different shades of the same color (pale pink, blush and an occasional pop of fucsia) or lighter colors—but always remember a pop of color never hurts. Adding a little dark crimson or burgundy to whites, pale peach and pale gold could be really nice in any outdoor setting. 3.Look twice. Even if you are getting married at the same time of year as your initial walk-through of the venue, you should still not expect it to look the same. Perhaps when you saw it the first time, the magnolia tree was blooming and you envisioned taking your first-look shots under that beautiful magnolia tree. Sometimes, like this winter, the temperatures change so much that the flowering trees bloom irregularly. By doing a final walk-through of your outdoor venue one to two weeks before the wedding, you still have time to make adjustments-changing photo shot lists and adding floral or potted plants or other supplementary styling décor. This will help you avoid any unpleasant surprises. 4.Dancing in the moonlight. A moonlit wedding reception can be beautiful and romantic, but maybe a little dark. Add a little mood lighting—keeping it romantic—with tea lights and votives and/or floating candles on the tables, lanterns or torches along paths, bistro lights above the dance floor and votives that hang from trees. Remember: the number one key to any wedding, but particularly an outdoor wedding, is to celebrate the subtleties of flowers—let the flowers complement the venue YOU chose, let the flowers complement YOU. Follow these simple steps and you’ll succeed and have dream-worthy outdoor wedding. Some may call you brave for planning outdoors. I think you’re brilliant! Just remember…always have a rain plan.